As some of you know, I have joined a Nike Running Club. I've just left a bit of space there for those of you who know me of old to pick yourselves up from the floor and sew up your sides and opt for surgery on the various hernias that you will now have ruptured. But no, really, I have. 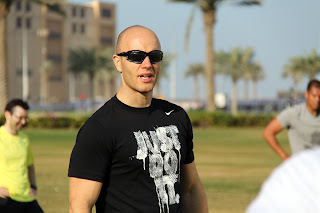 I've written before about the 'Dubai stone' that creeps on many who move to the Emirate and my various attempts to combat it and I shan't bore you again, but after making some pitiful attempts in the gym over the summer, a friend brought the running club to my attention. Five-year-old me at my first PE lesson, (it was called games then) at my village school in a pair of green patterned shorts and, if I recall correctly, a Victoria Plum t-shirt and those marvellous black plimpsolls with the stretchy bit. There was running, there was jumping, there were things involving skipping ropes, there was running while carrying things. The distinct memory I have of it is trying, doing the same things that everyone else did, the same actions with the same effort but something wasn't right. Everyone else's ball would travel metres before hitting the target, mine would trickle a little further on than my feet, everyone else would finish running without breaking a sweat and I would turn up half a minute later panting for breath, everyone else managed the skipping while I tripped over my rope and cried. There is one reason and one reason alone for this, and that is physical ineptitude - a condition that afflicts the bookish among the population - or so I am led to believe. Or, do we become bookish because we need something to do rather than flailing around while people point and laugh? It's chicken and egg. Which came first? The books or the inability to participate in physical activity? My ineptitude was and indeed is a bad thing because I am both highly competitive and a bad loser, not a good combination, but I did try at sport. My sister recalls a particularly amusing episode when for some reason I got put in the reserves for a school inter-house cross country competition which meant you still had to run but your time wasn't registered unless someone was injured and dropped out. All the other runners went past, obviously, then a couple of minutes later (well probably more than that) I came past sobbing and threatening to vomit. Dignified. This inability used to really bother me but after a while I resigned myself to being picked last for every single team and hitting the ball about twice in roughly 2,000 rounders matches. I was pretty glad to kiss goodbye to such things when I reached the end of compulsory education. There is, of course, a problem with this in that you can turn into a right fatty if you don't move around a bit at least once a week as you reach adulthood and hurtle past 30, particularly when you're in a country where it's too hot to move for a part of the year and getting a takeaway or eating out is cheaper and easier than cooking for yourself. Who is that idiot? Jumping in the air (at only just gone 8am on a Friday, I might add) with something resembling vim and vigour as if she hadn't a care in the world? What on earth is wrong with her? Why isn't she in a darkened room grumbling about anything and everything and pointing out that nearly everything on the planet is rubbish except her? The ineptitude has remained. I do feel sorry for the personal trainers who are syndicated by Nike to train the terminally physically incapable like me. They have their work cut out but if they feel any frustration, they do not show it. Luckily, there are some genuinely very good runners in the group and there are some good runners in the group, some above average runners and some average runners and some not that good runners. Unfortunately, all of them leave me in the dust and have already started on the sprint training or the situps and spidermans long before I rumble over the hill to the finish in a demented and exhausted fashion. Yet, because you get presented with Nike gear for regular attendance, I am building a collection of t-shirts. So, I am to be seen, twice a week, shambling around in lycra, yes, lycra, in public, in the environs of Festival City and Burj Park with the hallowed big tick on my chest and something resembling a satisified smile, or more likely an exhausted grimace, on my face. There is a small corner of my psyche that is slightly perturbed by the fact that despite my efforts, I am still the worst or nearly the worst in the group but I choose to be amused by this. I persist because the running club is perfect for an impoverished hack like me as it's free due to the training being paid for by Nike. It's clearly unlikely that they are doing this out of the goodness of their hearts and it's safe to say they get plenty of valuable publicity when they hand out free stuff and by people like me blogging about them. I'm not sure that I'm quite the sporty, healthy, wholesome type they have in mind when they design their sweat absorbing, stretchy, brightly coloured gear. On the other hand, perhaps I'm exactly the type. Let's face it, there are more like me - bile-filled inepts who shun daylight, positivity and physical activity where possible - than healthy sporty types on the planet. Wouldn't that be ironic? That my sporting inability has led me to become the precise target audience of a sportswear company? Although I have hauled my sorry behind around charity races before - a 10km in the fairly pitiful time of 1 hour 12 minutes was my last effort - it's only since I joined the club that I became aware of some of the things I am doing wrong. I chose running as a way to try to get fitter or at least try to remain reasonably fit as I get older because it's a sport that you can do alone and that appeals to me. However, disappointingly, it turns out to be the case that having fellow runners and a mega-fit professional to encourage you does work and that it is true that doing proper stretching will mean you have fewer pulled muscles. You have no idea how distressed I was when I finally had to admit that those are two true facts. Now I've got that gratuitious picture out of the way, all I need to do is say if, like me, you are in Dubai and want to do some sport or physical activity but don't want to be humiliated or badgered or made to feel inadequate, Nike Running Club might just be for you. 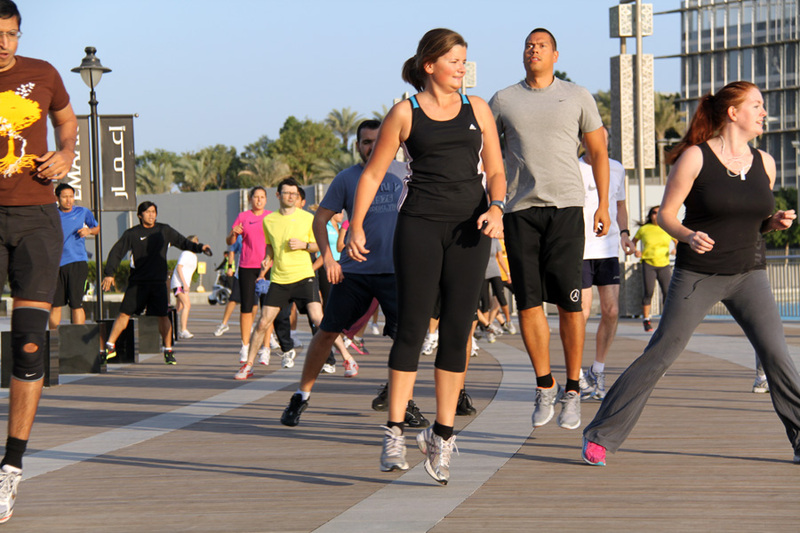 It meets at 6.45pm on Tuesdays outside the Nike store at Festival City, at 7.45am on a Friday at Burj Park and at 6.45am on a Saturday in JBR. No of course I haven't made it to the Saturday one yet. What do you think I am? Some kind of sicko? 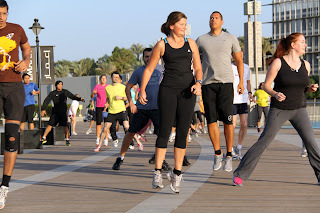 Have a look here and click on Nike Run Club Dubai if you're interested in that one.